King David: Beloved of God and of God's people. 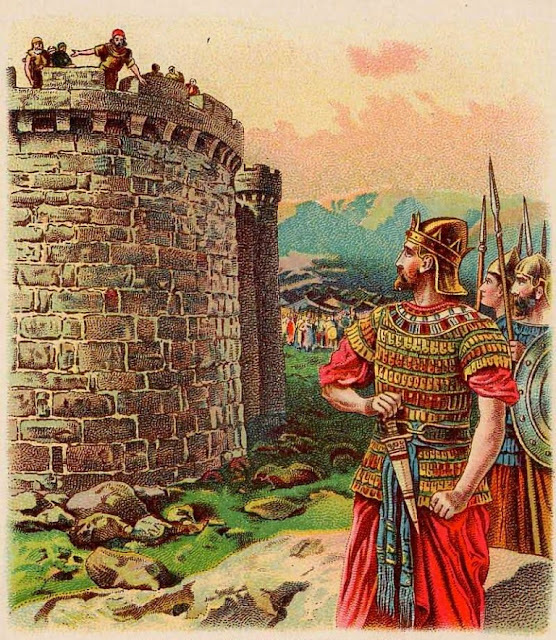 Back when David was a young man, God said that he was a man after His own heart (of course when David later took it easy, lusted, schemed to commit adultery and followed through with the sin, and then plotted and ordered the murder of an innocent man to hide his own wickedness, God could not say that of him). But David repented and aside from this black blot on his life, David was a great man of God, a faithful servant, a righteous and humble king, a praying man as well as a songwriter, a fearless warrior and long-term soldier, a sacrificial giver, and an industrious and a successful man. All this takes much time and it came out of David's short life. Military campaigns alone could take dad away from the home for weeks or months at a time. So sadly, David was an often absent father and therefore woefully ignorant. Of one of David's sons Adonijah, God makes us know that David had never displeased him at any time. Note this example of a father who made a sad mistake here that later caused him grief and troubled God's kingdom. And God heard his prayer for David feared God. And God did bless his descendants, but many still lost their way and were very wicked. If only David could have dedicated his energy and time to training his children as much as he gave of his strength to his other enterprises for God, I believe that he would have seen even more of his descendants fear God as their father did. I cannot be a father absent from the life of my children and expect God to do all of my work for me. But I do need to humbly and earnestly pray and fast as David did for God to save our children. For training and teaching without God's great intervention is never enough.